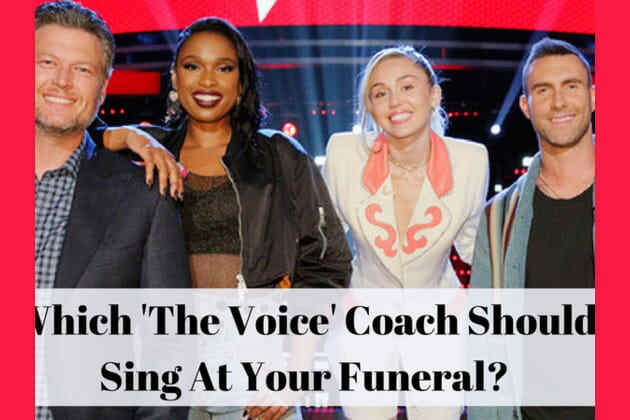 Which 'The Voice' Coach Should Sing At Your Funeral? And what kind of readings would be done at your funeral? Yes or No: I'd come back as a ghost. Where would you hold your funeral? BONUS! Have you ever actually watched "The Voice"!? Miley Cyrus should sing at your funeral! Blake Shelton should sing at your funeral! You're a classic sort of person, which makes Blake Shelton the perfect crooner to memorialize you. Blake's dulcet tones will remind everyone of how you're a big bright ball of love, for which all are grateful for. Your time on Earth was truly a gift! Jennifer Hudson should sing at your funeral! You're a soulful sort of person, which makes Jennifer Hudson the perfect singer for your funeral. All throughout life, you've made sure to make things as profound as possible. Jennifer will make sure your friends and family will feel that deeply, with so much love and light. Adam Levine should sing at your funeral! Find out which famous singer will help you RIP!